This is the question that always pops up along with the other requirements for Marriage in Thailand. The Thai dowry system, which is more commonly known as Sin Sod, is deeply rooted in Thai culture. It is a way of honoring your bride’s parents for raising their daughter well. This is also a way of showing that you are financially capable of taking care of your Thai bride throughout your married life, because her parents tend to consider financial security as basis for the marriage. You will need to negotiate with your bride’s parents regarding the amounts of the Sin Sod and Tong Mun. Tong Mun, which means gold engagement, is 24-karat gold that you give to your wife-to-be. The rule of thumb is, the higher the amount of the gold, the better. This is similar to the giving an engagement ring in the West. Then there’s the Sin Sod, or the actual dowry, which can include anything of value, but usually it is about the money. Most Westerners get confused with the amount of dowry that they have to pay to their Thai bride’s parents, as dowry prices are set at unbelievably high amounts ranging from 100,000- 1,000,000 baht. One important thing that you should keep in mind when discussing Thai dowry is that its amount is based on your Thai fiancee’s status, education, occupation and other related social background information (such as her virginity). 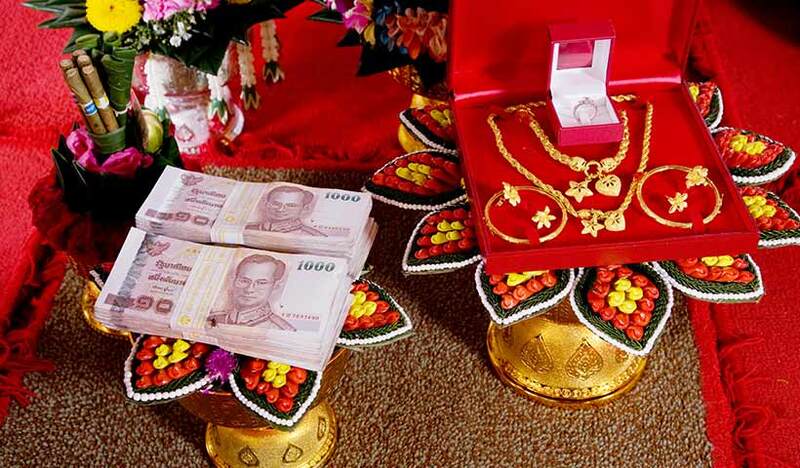 An average middle-class, university-educated Thai lady deserves a dowry of 100,000- 300,000 baht. A dowry of a million baht for an uneducated lady of modest means is just ridiculous. Thai dowry prices fall drastically if your bride-to-be has been previously married, already has children, or is not a virgin anymore. In fact in most of these instances, no dowry deserves to be paid. Thai dowry, however, is usually symbolic in nature and will normally be returned to the married couple after the wedding, so as to help them start on their new life. When registering your Marriage in Thailand, there is really no need to show proof that you have paid dowry, as it is presented during the actual wedding ceremony itself. Marriage in Thailand can be the best experience you will ever have, but it would be best to inform yourself as much as possible about all its traditions and requirements. It would be best to engage the services of a reputable Thai law firm who can assist you with Marriage Registration in Thailand and even drafting a Prenuptial Agreement to secure your assets prior to your union with your Thai fiancee.